We’ve recently launched a new show called “Now Your Turn” on Geek & Sundry that was filmed using Google’s new VR180 format. When VR180 was announced, it was met with a fair amount of skepticism from the 360 video community. This article won’t debate the merits of VR180 except to say that I don’t think the existence of VR180 takes anything away from 360 video. For reasons I will get into, I believe they are different mediums with different creative uses and audiences. So let’s move on. This was the first time Light Sail VR had worked with the VR180 cameras and workflow, so naturally there was a lot to learn. Here are my tips and tricks, hoping it will help you on your VR180 production. “Now Your Turn” was born out of some testing we did over a year ago at Geek & Sundry. 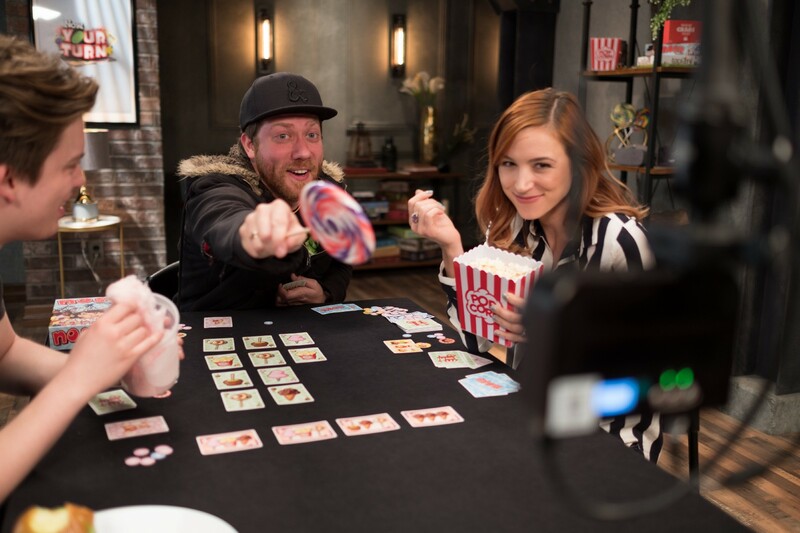 My business partner Robert and I thought it would be exceptionally cool to not only learn how to play a board game, but to actually feel like you are sitting at the table playing with the funny, amazing talent on their channel. For me personally, I always enjoy learning a game by sitting with my friends and watching them play. Vince, Ivan, and Becca were all told to treat the camera like a real person. Sitting at a table gives you a motivated reason to look forward and never behind you. The financial costs of working with VR180 are less due to no longer needing to do any time consuming compositing work such as removing the tripod and lights, etc. The improved resolution and excellent 3D of VR180 would make the experience more immersive for our audience. Unlike 360 video, this wasn’t storytelling through place. This was all about the people and the board game in front of you. It made perfect sense for this new medium so we brought the idea to Google. Google was eager to work with us and was really excited about the project. POV storytelling is easier in VR180. 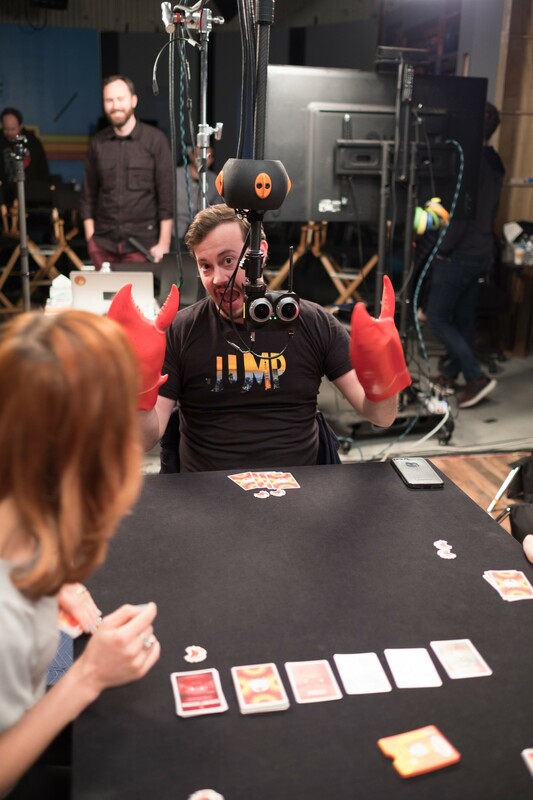 Producer Robert Watts played our crab hands for the game “You’ve Got Crabs” by Exploding Kittens. 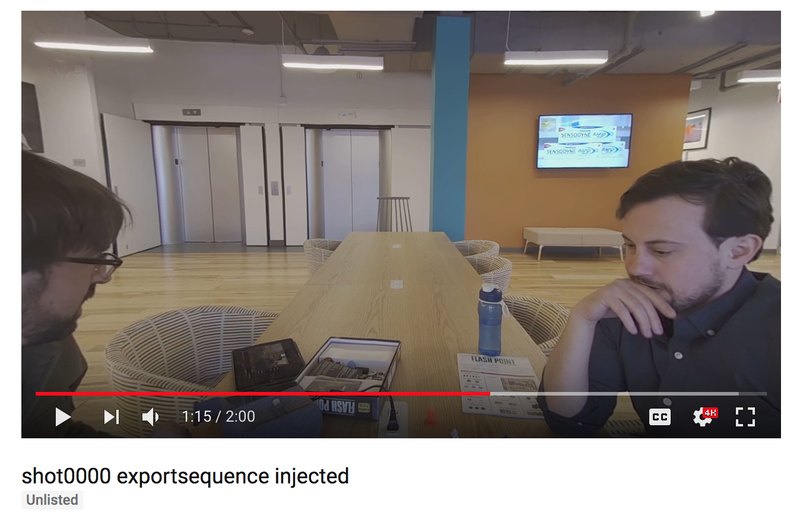 One of the most interesting (read: challenging/frustrating) aspects of the VR180 format is the fact that outside of VR mode, YouTube basically crops the center part of the image and you are stuck with it. There is no reframing in post and worst of all (as we discovered) no guides. Robert and I did our first test with the camera and were shocked to find out how underwhelming the experience is on a browser in 2D. Even though I wished VR headsets were available to everyone, I know that the majority of people will not be experiencing my content in a VR headset, despite the fact that it’s MUCH better when viewed in one. Our first test on YouTube was horrible. Can’t see the board! This wasn’t going to cut it. I took my equirectangular output and brought it into Photoshop. I first used Photoshop’s spherical view to unwrap the image and the FOV to approximate the same view as I was seeing in the YouTube player. Using the exact science of “eyeballing”, I drew a square box that covered what I could see in the crop on YouTube. This told me what would be visible. I ended up inverting it and creating a transparent PNG that I could overlay on top of the ZCam Controller app on my PC. I used Custom Desktop Logo to accomplish this. The crop overlay was essential in framing shots. Having the title safe crop was incredibly important to the show. We needed to make sure game elements didn’t fall outside the view. We also wanted a way to make sure our talent was framed correctly. I understand the reasoning behind the crop. A lot of people watching 360 videos (myself included) on the phone are annoyed that the image moves around, or maybe it starts accidentally when we’re looking at our feet and we see only black. The static crop ensures that the center view is always visible. What’s difficult is that post-manipulating what’s presented inside the crop is currently not possible and we don’t have easy-to-use guide zones on set to help us when capturing content. Also, creative decisions that work great in VR180 don’t always translate well to the center crop and this means certain story elements can be left out. 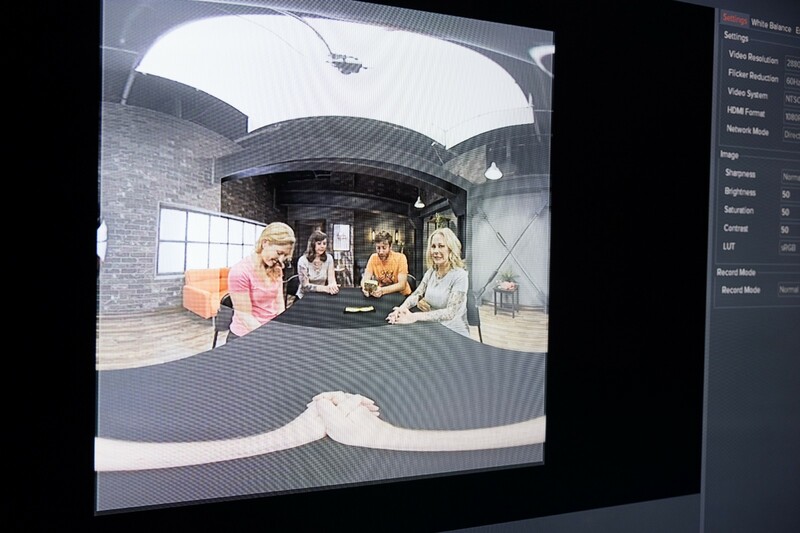 We had to work extra hard on “Now Your Turn” to ensure that graphic elements made up for the fact that the audience couldn’t see their own hands outside of VR. Editor Trace McNabb laying in the graphics with the crop. Creatively, it is very restricting to have to design one video file for two very different ways of consuming the content. I hope other solutions present themselves going forward. Otherwise, working in VR180 was very much the same as working in 360. I decided we would always work with the final resolution media and utilize proxies since that was the workflow we were already used to with cameras like the Odyssey and the Halo. The advantage of working with 180 footage is that since we didn’t have to worry about a seam line, we could utilize more of our traditional effects like those from Boris FX. I’m really proud of Light Sail VR’s first VR180 show. It was a creative challenge and ultimately I find the episodes fun to watch and the format feels organic to VR. While they stand on their own viewed on a desktop, they really do shine in a cardboard or Daydream View headset. Looking down at crabs hands always makes me laugh! Some people say that VR180 is a cop out. That we shouldn’t embrace it only because it’s easier. I agree with that last point. Don’t embrace VR180 because it is easier. Embrace it because you find something creatively rewarding about it. 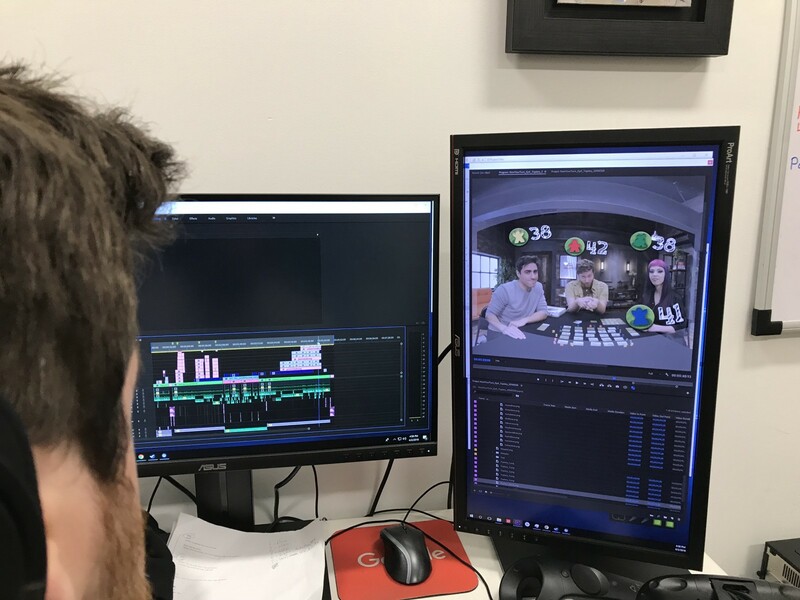 Working with VR180 footage was technically easier, which left us more time to be creative rather than fighting the tech. I think this made for better content in the short time frame in which we had to deliver. I think “Now Your Turn” is a show built for VR180 and makes good use of the medium’s strengths. Go check out the episodes at Geek & Sundry and let us know what you think in the comments! New episodes will be dropping every Friday between now and International Tabletop Day on April 28th!